Description: Rich charm and and elegance come to light with Angelique, a wall sconce designed as a dramatic accent for a hallway, entryway or any other room. 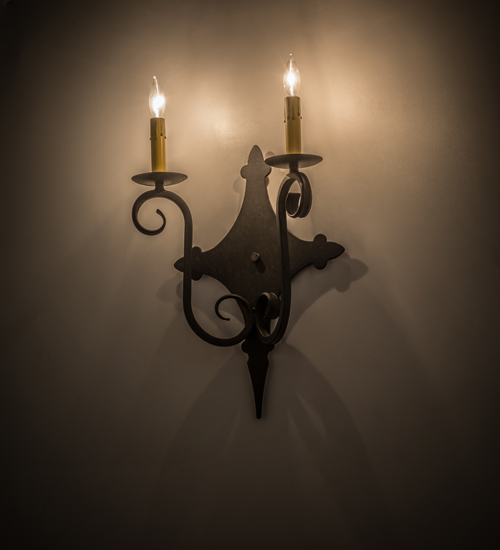 This enchanting wall fixture features two Ivory faux candlelights perched on bobeches with scrolled arms and hand forged Iron hardware featured in a Chestnut finish. Handcrafted by highly skilled artisans in our Upstate New York manufacturing facility, this fixture is available in custom sizes, styles, colors and dimmable energy efficient lamping options. The sconce is UL and cUL listed for damp and dry locations.